Special Containment Procedures: SCP-1447-1's current containment unit comprises an airtight 2.5m x 2.5m x 2.5m concrete container, reinforced with 6cm ablative steel plating and suspended within Bay 4. The cell exterior is to be inspected daily and any damage reported immediately. Dented or otherwise structurally compromised plating is to be patched; a reserve of replacement steel plate of the appropriate gauge is to be maintained at 30 square metres. Discovery of any hole or crack in the plating should be considered a breach of containment and SCP-1447-2's quarters are to be immediately secured. SCP-1447-2 is confined to his quarters, the location of which relative to SCP-1447-1's containment unit has been selected to minimise possible interaction between SCP-1447-1 and other Euclid and Keter-class SCPs as well as incorporating blast-proof screens and chokepoints to be employed in the event of a breach. Reasonable requests from SCP-1447-2 may be granted with the exception of any item which could facilitate external communication. SCP-1447-2 may be consulted by maintenance staff on issues relevant to his primary area of expertise - however, following Containment Breach 1447-01, SCP-1447-2 is no longer granted freedom of the facility. SCP-1447-2 is to spend at least 4 hours a day meditating on the following topics: 'SCP-1447-1 is getting weaker', 'SCP-1447-1 is dying', 'SCP-1447-1 is unable to maintain physical form'. Any qualified practitioners of Tibetan Buddhism on-site are instructed to participate in these sessions. Topics which could imply a containment breach such as 'SCP-1447-1 is going away', 'SCP-1447-1 is being reabsorbed into my mind' or similar are not to be employed. Failure by SCP-1447-2 to comply with this procedure is punishable by removal of requested items and privileges. Description: Although current containment measures and the speeds at which SCP-1447-1 typically move make close observation impossible, initial recovery and SCP-1447-1's numerous breach attempts have substantiated eyewitness reports of its appearance. SCP-1447-1 is a quasi-physical humanoid entity resembling an Asian male in traditional Tibetan Buddhist monastic garb; its face is visually distorted and indistinct, even when viewed on high-speed footage. SCP-1447-1 typically remains in constant motion - frequently in excess of 200kph - for approximately 20 hours a day, which time is chiefly spent attacking the interior of its cell. Reinforcing SCP-1447-1's containment unit with hardened steel plating has been successful in reducing the incidence of breaches but has not proven totally immune to SCP-1447-1's efforts. SCP-1447-1 is very capable of exploiting small breaches in its containment unit and is able to insert itself through apertures as small as 200µm in diameter. SCP-1447-1 is largely resistant to standard-issue sidearms - higher caliber munitions appear to temporarily disrupt SCP-1447-1's physical form, causing it distress, and have been effective at forcing it back into containment. High explosives have proven effective at completely dissipating SCP-1447-1; however, when attacked in this manner SCP-1447-1 has shown the capacity to rematerialise anywhere in the immediate vicinity, ignoring any intervening barriers. Furthermore, during Breach 1447-05 SCP-1447-1 apparently goaded security personnel into employing explosives near the containment area of SCP-████, resulting in an additional breach event. 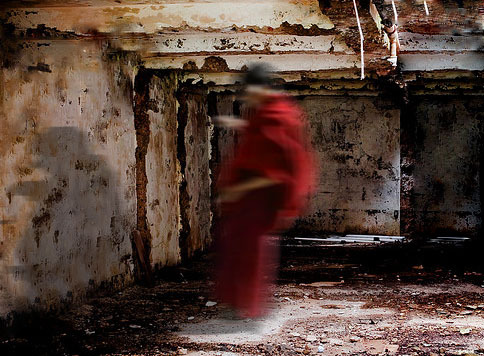 Attempts at communication with the entity to determine sentience remain inconclusive - although SCP-1447-1 responds to questions its vocalisations are largely unintelligible; analysis has revealed them to be garbled versions of mantras in the Tibetan Buddhist tradition, repeated hundreds of times a second. SCP-1447-1 is not implacably hostile to human life and remains focused on reaching and killing SCP-1447-2. However, Foundation personnel who attempt to impede its progress are subject to attack and if frustrated in its efforts it has been observed to become indiscriminately violent. SCP-1447-2 is a 5█-year-old Caucasian male who claims to be ███████ ████, a computer hardware and software entrepreneur of some note. SCP-1447-2 has been unable to explain the continued activity in the public eye of his namesake, a figure who shares SCP-1447-2's alleged identity and life history, but has speculated that he may be an imposter hired by his business associates. His counterpart is to be kept under surveillance by Foundation personnel as another possibility is that either SCP-1447-2 or his counterpart is an entity similar to SCP-1447-1. SCP-1447-2 claims that a lamasery allegedly located in Qinghai province, China provided him with the location of Site-73 and arrived there on ██/██/████ seeking sanctuary from what he described as a 'tulpa' (see Interview 1447-21). Two days later Site-73 came under repeated attack by SCP-1447-1, resulting in the deaths of two Agents. SCP-1447-2 was evacuated via plane and the attacks immediately ceased. SCP-1447-2 was transported to London and subsequently moved to Site-60 - SCP-1447-1 took under three weeks to locate the site, again attempting to breach its security and gain access to SCP-1447-2. On-site personnel were ultimately able to funnel the entity into an early version of its current containment unit at significant cost in terms of expended human and material resources. SCP-1447-2 has been informed of the death of his counterpart; he requested a full medical checkup, which was granted. Tissue and hair samples taken from SCP-1447-2 show no anomalous characteristics. SCP-1447-2 remains convinced that he will be successful in the destruction of SCP-1447-1 through the application of methods of concentration and meditative practice. Successive breaches have indicated no change in the capabilities of SCP-1447-1 to date. However, it is noteworthy that the entity's activity within its containment unit is severely curtailed during periods in which SCP-1447-2 engages in focused meditation on the abolition of the tulpa. Thermal imaging reveals that SCP-1447-1 is almost completely still during these periods, adopting the vajra meditation position. Foundation consultants versed in the Tibetan Buddhist faith have posited that SCP-1447-1 may be sufficiently sentient to be able to meditate on its own existence, thus reasserting itself. Proposals are under consideration to incorporate means of disrupting SCP-1447-1's meditation into its containment unit - the incorporation of a hydrochloric acid bath similar to that employed in the containment of other Keter-class SCPs is presently considered too likely to lead to a breach via the delivery mechanism; other possibilities include microwave emitters to heat the interior of the unit and high-volume sonics proven to inhibit concentration. Current theories indicate that the death of SCP-1447-2, at the hands of SCP-1447-1 or otherwise, is unlikely to result in the destruction of the tulpa given its current level of autonomy; controlled infliction of pain on SCP-1447-2 shows no corresponding change in behaviour on the part of SCP-1447-1. However, SCP-1447-1 is currently containable largely by virtue of the fact that it consistently seeks out and attempts to kill SCP-1447-2; freed from this compulsion the entity would become completely unpredictable. For the foreseeable future containment efforts must focus on further reducing the incidence of breach attempts and minimising the exposure of other Foundation assets to SCP-1447-1. Dr. R: How are you feeling today, SCP-1447-2? SCP-1447-2: That's not my name. Dr. R: I understand that you claim to be ███████ ████. SCP-1447-2: I am █████ ████. Dr. R: We'll get to that. What is the nature of your connection to SCP-1447-1? SCP-1447-2: That's what you call the tulpa, isn't it? Dr. R: That is what we call the entity that has thus far attacked two of our facilities in an effort to get to you. Dr. R: You created SCP-1447-1? SCP-1447-2: Yes. After '85 I resumed my travels in India and Tibet. I guess I was seeking a spiritual experience. Dr. R: You were a tourist. SCP-1447-2: Yes, of sorts. I found a group of monks in Qinghai who said they would teach me how to create a tulpa. Dr. R: What did you hope to accomplish? SCP-1447-2: Well. A tulpa is supposed to be a, a thought-form, made visible and tangible to others through intense meditation. Dr. R: Answer the question. SCP-1447-2: I thought I had. I guess I didn't have any ulterior motives. To manifest my thoughts, to impose my will on reality; isn't that enough? Dr. R: You couldn't control this tulpa? SCP-1447-2: At first I could. I wanted to manifest the Budai. You probably know him as the Fat Buddha, but he wasn't a Buddha, he was a folkloric deity. The monks told me to choose something else but I became fixated on it. Dr. R: If you don't mind me saying so, footage we have of SCP-1447-1 does not resemble the Fat Buddha. SCP-1447-2: No. Over time he changed. He became thinner, meaner-looking. Dr. R: Its behaviour changed. SCP-1447-2: Yes. I imagined him as jolly, a prankster. It would play practical jokes on me and the other monks, but over time they grew more and more spiteful. SCP-1447-2: It began to do things like putting pots of scalding hot water over doors. He hid snakes in our sandals. Harmless first, then poisonous. Dr. R: I wasn't aware there were venomous snakes in Tibet. SCP-1447-2: There's one. The Fea's viper. But you're right, their habitat is hundreds of miles south of the monastery. I didn't understand how he had got it. Dr. R: And now you do. SCP-1447-2: His speed. Yes. One day I realised I couldn't visualise his face any more. Dr. R: That was a turning point? SCP-1447-2: Yes. He became murderous. The monks caught him trying to cut my throat during the night. Dr. R: They were able to see the tulpa by this stage? SCP-1447-2: Yes. They were afraid the tulpa would kill them too. They told me about ██████. Note: Operational codename for Site-73 used exclusively by recovery agents. Dr. R: You are aware that it is quite impossible for them to have knowledge of that facility. SCP-1447-2: So you tell me. SCP-1447-2: I've told you as clearly as I can. Ask your damn IT department. Dr. R: How do you account for these? Note: Dr. Rolfus shows SCP-1447-2 a number of recent press cuttings concerning his namesake. Dr. R: There is in fact no evidence that █████ ████ left the United States during the period we are discussing. In fact, I have copious evidence that during the time you claim to have been in Tibet he founded another company. SCP-1447-2: Maybe ███████ hired someone to impersonate me. It says I'm back at █████. There's your motive. Dr. R: Rest assured we'll be keeping both █████ ████ and ████ ███████ under close observation. SCP-1447-2: No, that's not good enough. I want my life back. You don't have the right to detain me here. Dr. R: Mr ████. You are here because you are currently the target of an apparently supernatural being that has thus far cost this organisation an extraordinary amount of money and dozens of lives to contain. We have every right. Tell me, what happens if SCP-1447-1 kills you? SCP-1447-2: I don't have to listen to this. Dr. R: Will SCP-1447-1 cease to exist if you die? Answer the question. SCP-1447-2: I refuse to answer. Note: Interview terminated by Dr. Rolfus.